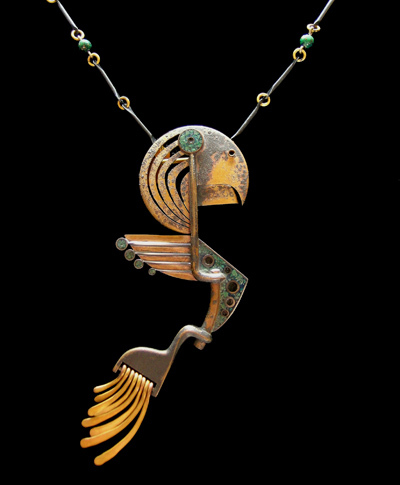 LISA and SCOTT CYLINDER began collaborating in 1988 shortly after graduating from prominent University Jewelry Programs. They have created limited production studio multiples under the auspices of CHICKENSCRATCH for the past 23 years. Ten years into their venture, they craved a greater technical and creative challenge and began making One-Of-A-Kind pieces under "L and S Cylinder", in addition to their studio multiples. The skills they use for these grander works were never fully explored before. This jewelry is more substantial and more serious, both in concept and execution. The Cylinders began manipulating and incorporating Found Objects and Epoxy Resins into their metalwork. They take a no-holds-barred attitude about materials and techniques and create a very limited number of highly collected Art Jewelry pieces.